A Couple of Wild and Busy Guys! Those who frequent the Texas, Wisconsin, North Carolina, Georgia, Great Lakes, Maryland, Virginia, Ohio, and Florida Faires will no doubt recognize the lusty, action-comedy duo of Hack and Slash. John Davis as Sir Nigel Hack is a rich, swaggering braggart who is often upstaged by his young and wily squire, Slash Montant, played by Spencer Humm . 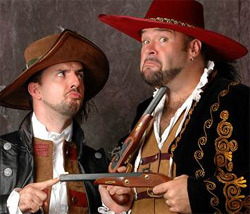 Davis and Humm have been portraying these two since 1992 when the actors joined to bring outstanding swashbuckling action and fresh, edgy comedy to live theatre audiences. Since then they have performed over 3,000 shows in 15 different countries, even touring parts of Africa and the Middle East. Not ones to kick back and take it easy after fair season, they keep busy with projects ranging from club comedy to charity work with children. Since 9-11 they have made six tours to entertain the troops in Italy, Afghanistan, Iraq, and Kuwait. One hospital visit in Bagram, Afghanistan, stands out to Slash, " The poor kids were in bad shape with scarred up faces and missing limbs. The youngest was five. We had a moment of doubt as to whether we could do anything for these kids who spoke little or no English and were in such a sad state." They had gone there with fellow Operation Swashbuckle performers Todd Key (of the Zucchini Brothers), and Dan Thurmon who juggled and performed magic tricks for the children and their families. Hack and Slash couldn't do any of their usual sword and whip work at the hospital so they delighted the children by blowing bubbles. "By the time we were done, every single patient and many of their family members had cracked a smile or chuckled. One boy whose face had been completely disfigured laughed out loud as Todd and Dan passed juggling clubs around his brother who was visiting. Despite the scabs and scars on the face of one little eight-year-old Afghani girl, it was undeniable that she was absolutely beautiful. She had touched a Russian landmine and her injured arm was wrapped up in a splint and cast. We were later told by Sgt. Marx, our coordinator, that she also had nerve damage to her other arm as well and would not let anyone touch it for blood pressure checks or otherwise. Not knowing this, Todd asked her to extend her finger to let him spin a ball on it, Globetrotter-style, and she obliged, also accepting a coin and handshake from me with the same arm on the way out with a big smile that melted everyone's hearts." Afterwards, Slash recalls, the nurses told them that they were floored by the way the girl had responded and that it was a real breakthrough for her. smashing bed of nails stunt! For a whole month every year the four members of Operation Swashbuckle travel by helicopter, troop transport, jeep, tank, and airplane to entertain wherever the troops are in need of a massive moral boost. They carry all of their props, costumes, sound, and lighting equipment with them, as well as a large bed of nails! Some of the places they visit haven't ever had a USO visit so the soldiers are always willing to help. Accommodations can be Spartan, so Humm and Davis have become well accustomed to tents, barracks, flight-line noise, and sand. 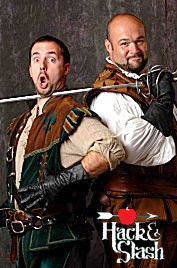 Between the Great Lakes Medieval Faire and the Maryland Renaissance Festival, Hack and Slash will be hosting their first Action Hero Boot Camp at the Vanderveer Mountain Spa and Retreat near Washington, DC. During this three-day retreat from August 18 to 21, they will be teaching professional stage swordfighting, bullwhip cracking, tactical shooting, and an "action hero obstacle course." They will also hold navel battles in the swimming hole, nightly bonfires, and for an extra charge, skydiving! All of the action will be filmed for a camp highlights DVD and each guest gets to star in his or her own action hero scene. The action never stops for Hack and Slash, not even in the winter. Others might slow down, but that's when Hack and Slash put on their own hilarious version of the Charles Dickens classic, A Christmas Carol at the Chesapeake Art Center outside of Baltimore. The musical includes many of their funniest and most talented friends in what amounts to a wild and crazy show with Davis playing old Scrooge and Humm as Jacob Marley with a little of Barry Croaker the grave digger thrown in for good measure. 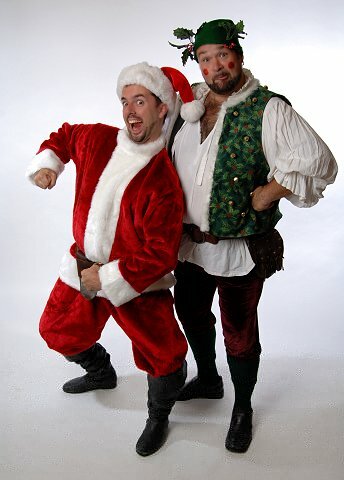 Other Renaissance Faire circuit favorites include Brian "Broon" Howard as Christmas Past, the Zucchini Brothers as the ghosts of Christmas Present, and Ded Bob as, what else, the ghost of Christmas Future. Even the audience gets involved and for some reason they like to attend dressed up… in their pajamas! Tickets are on sale now and you can purchase discount tickets online at www.TicketLeap.com! Hack and Slash perform for corporate events, too. When they were hired for an insurance convention they mingled with the crowd dressed as agents then started their act by picking a fight with each other that escalated into a full blown sword duel! As if that is not enough, from time to time you can catch them performing at comedy clubs and colleges around Washington DC, entertaining at the Improv Festival in Miami, or teaching classes in stage combat and comedy improvisation all over the USA. So look for Hack and Slash this month until the 13 th in Cleveland, OH, at the Great Lakes Medieval Faire, and in Annapolis, MD at the Maryland Renaissance Festival every weekend until October 22. Look for them next year in their new show The Hack and Slash Shakespeare Massacre. Hack and Slash have a great website with all of their bios, schedules, photos, and updates on their many activities. Here are a few of their links as well as some of their friends. Hack and Slash Christmas Special, The Musical! Ded Bob, the answer is Hey what! If you want to add this article to your list of favorites or email it to a friend, please use this permanent URL, https://stores.renstore.com/-strse-template/0608A/Page.bok. Permission is granted by the author to quote from this page or use it in handouts as long as you include a link back to Renstore.com.